You can change, store, and delete the wallpaper on the audio/information screen. You can import up to three images, one at a time, for wallpaper from a USB flash drive. 3. Rotate to select System Settings, then press . 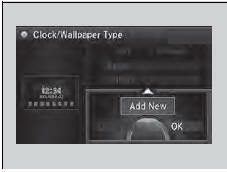 - Repeat the procedure to select Clock, Clock/Wallpaper Type. 4. Move to select Wallpaper. - The screen will change to the wallpaper list. 5. Move to select Add New, then press . 6. Rotate to select a desired picture. - The preview is displayed on the left side on the screen. Then the display will return to the wallpaper list. • When importing wallpaper files, the image must be in the USB flash drive’s root directory. Images in a folder cannot be imported. • The file name must be fewer than 64 characters. • The file format of the image that can be imported is BMP (bmp) or JPEG (jpg). • The individual file size limit is 6 MB. • The maximum image size is 1,680 x 936 pixels. 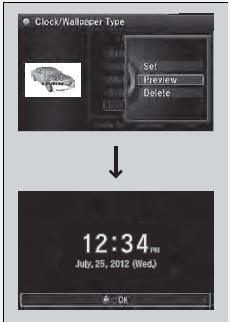 If the image size is less than 420 × 234 pixels, the image is displayed in the middle of the screen with the extra area appearing in black. • Up to 255 files can be selected. • If the USB flash drive does not have any pictures, the No files detected message appears. 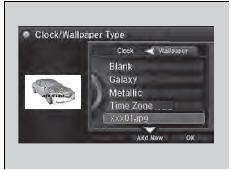 - Repeat the procedure to select Clock/Wallpaper Type. 3. Move to select Wallpaper. - The screen changes to the wallpaper list. 4. Rotate to select a desired wallpaper. 6. Rotate to select Set, then press . - The display will return to the wallpaper list. 4. Rotate to select a wallpaper that you want to delete, then press . 6. Rotate to select Delete, then press . 7. Rotate to select Yes, then press to delete completely. From the pop-up menu, rotate to select Preview and press to see a preview at full-size screen. To go back to the previous screen, press to select OK, or press the BACK button. When the file size is large, it takes a while to be previewed.